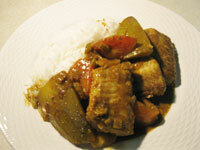 Curry fish is very uncommon. This is because many people think the fish will either break up or melt away while cooking. Follow my recipe and you will never stop making curry fish. This is one of the best meals I have ever eaten. Wash the Fish using the juice of 1 lime then rinse with cold water and set aside. Peel a green mango and cut into 5 or 6 pieces then set aside. Squeeze another lime into a glass and set aside. Add all other ingredients (except oil and tomatoes) in a bowl. Mix and add 1 cup water. Mix well. Heat oil in a pan/pot (non stick is very good), add mixture and stir for 4-5 minutes. Add 1 cup water and mango (if available) and continue stirring for 5 minutes or until mango is tenderized. Add small amounts of water if needed. Add fish and lime juice. Dip some of the gravy and place on top of fish until it is covered. Cover pot and let simmer for 2 minutes. Uncover and remove pan from the heat. Shake pan gently until fish moves freely, add water if needed and tomatoes. Place the pan back on the heat and cover. Allow to simmer for 3 minutes. Remove from heat and allow to stand for 5 minutes. This makes 4 good servings over Rice or Roti.